The SWD-COLLECT Software has been discontinued. Please see the SWD-DASYLAB Software as a possible alternative or contact our Data Acquisition Engineering Department. Collect for Windows allows you to collect data from virtually any RS-232 instrument, and put that directly into programs such as Excel, Lotus 1-2-3, Quattro Pro and many more. Multiple applications may be open and receiving data simultaneously from different instruments. As data is received in your application, calculations can be performed instantly and the results displayed. 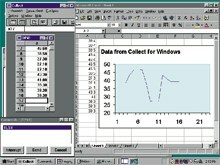 Collect for Windows can be combined with other Windows programs to provide real-time charting and plotting capabilities. It will also collect data simultaneously from COM ports 1 to 4 available on standard PCs.